NVIDIA recently announced their highest-end graphics card – the NVIDIA GeForce GTX Titan Z, featuring dual 28nm GK-110 core architecture and a huge 12GB GDDR5 memory. This is NVIDIA’s most high performance graphics card, not to mention the most expensive as well. We know that NVIDIA will be releasing a new dual GPU graphics card soon (thanks to rumors), after the announcement of Titan Black. But we’d never imagine that it would be named “Titan Z”. Most of us were expecting GTX 790 or something, but here it is, NVIDIA unleashed their beast that would challenge AMD’s Radeon R9 295X2 Vesuvius Dual Hawaii graphics card. Check out more details about Titan Z below. The NVIDIA GeForce GTX Titan Z, aside from having a huge 12GB of GDDR5 memory on a 384-bit x2 memory interface, will feature two GK-110 chips with full 2,880 CUDA cores enabled each, for a combined total of 5,760 CUDA Cores. It also features 480 TMUs and 96 ROPs and a total of 8 TFLOP/s for its SPFP (Single Precision Floating Point). However it is unclear whether the Titan Z features a full Dual Precision Floating Point at this time. 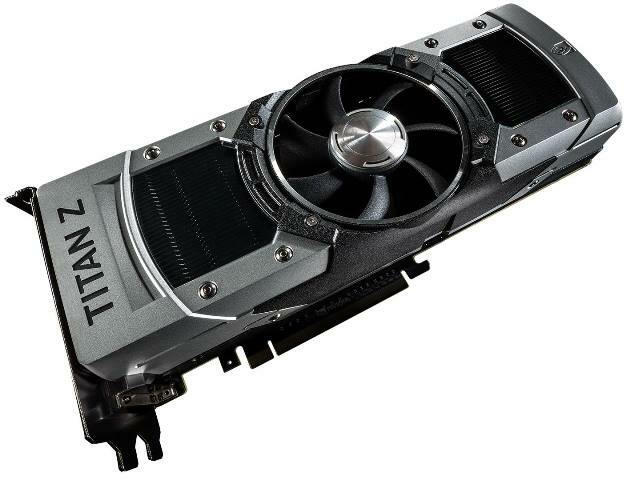 The GeForce GTX Titan Z features a large cooler design, similar to the one in GTX 690 but only bigger. As a result it will occupy 3 expansion slots. It will have two dual-link DVI output ports, a DisplayPort and an HDMI port. Despite that 4K gaming resolution is not that popular yet, the Titan Z is the first graphics card to be truly ready for the future 5K resolution display (5120 x 2700). This monster card has one SLI finger, so that you can put two of this in Quad SLI configuration. I’m not sure if a certain GTX 790 will be announced any time soon (targeted for mainstream users, enthusiasts and power gamers), but for now, this is NVIDIA’s latest dual GPU graphics card solution that will replace the old GTX 690. The NVIDIA GeForce GTX Titan Z will become available starting mid-2014, probably in time with the release of the Intel Devil’s Canyon. The Titan Z is said to have a suggested retail price of a whopping $2,999 USD. Expect that if other graphics card manufacturers, such as Asus, MSI or EVGA, would manufacture their own customized or OCed Titan Z, it will definitely go beyond $3,000 USD. That price range alone tells us that this card is not targeted towards mainstream or gaming purposes primarily. Definitely it will be targeted towards research and development or scientific studies that requires a much powerful graphics card for their experiments.